Indeed, there is a lot to be said for the horse, a critter which sadly doesn’t get out much these days. We see them mostly gazing longingly over the fence of the pasture in which they are confined, sometimes in a parade but mostly now on farms where they are featured attraction for kids but no longer an essential cog in the economic and social life of the community. It was not always so. From the day in 1808 when William Pike brought the first horse to Calais until the 1930’s the horse was indispensable to life in the St Croix Valley. The center of Calais during mud season, as it appeared until about 125 years ago. Nearly all of retail goods sold by stores on Main Street were moved by horse and wagon or sled during winter or mud season from the docks or the outlying farms. The Hill Pike store was on Main Street at the bottom of Church Street and is now the Cole Bridges Garage. 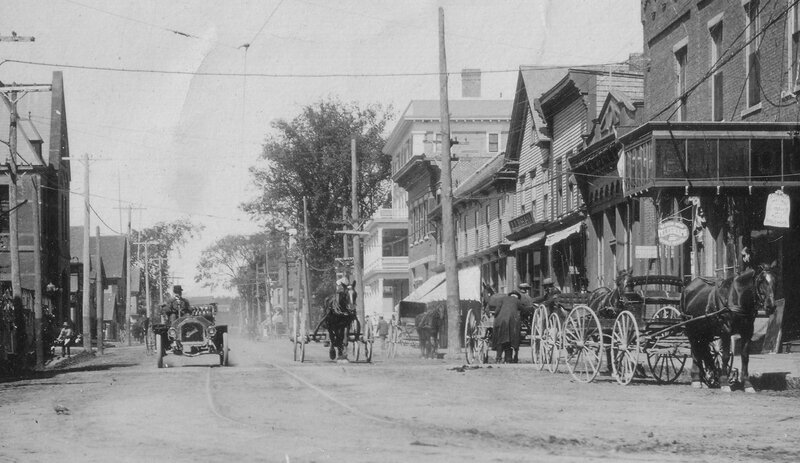 The corner of the building to the right is the corner of the Emmans Hotel, then the Border City Hotel and now the location of the gas station which until recently was J.D. Thomas. A skidder horse up to its nose in snow. Calais was once one of the busiest ports in the United States. 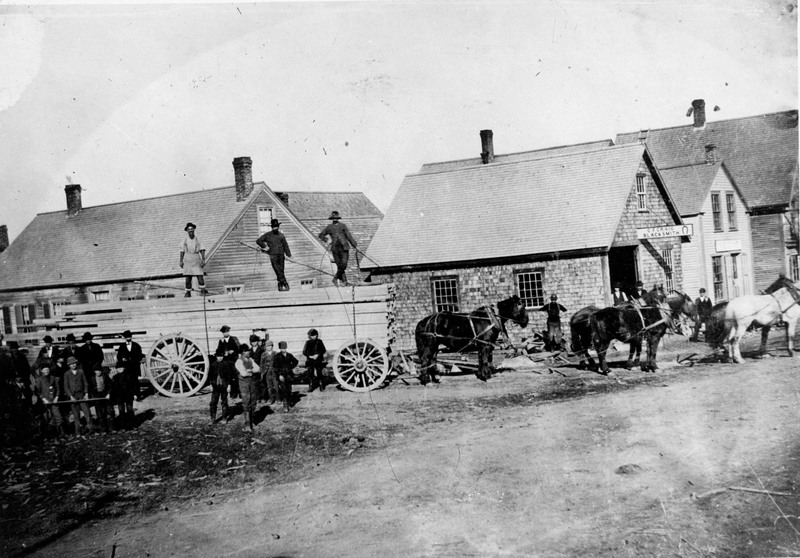 Lumber cut into boards, lathes, shingles in the dozens of mills along the St. Croix was the region’s primary export and logging would have been impossible without the horse which in this photo is hauling logs out of the woods.The horse on the left up to his chest in snow. Horses and oxen also dragged trees to the frozen rivers in the winter to be floated to the mills in the spring log drives. 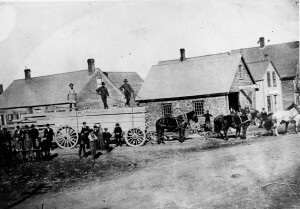 This six horse team is hauling a load of cut lumber from the mills in Milltown Maine to the lumber wharf in Calais, probably the Eaton Long Wharf at the bottom of Calais Avenue. 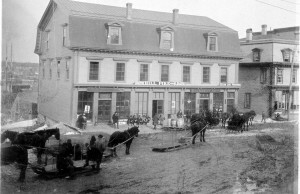 It was a hard pull for the horses, especially the hill on North Street just below what is now Tim Horton’s. In the spring and after heavy rains the hill would be so muddy and rutted as to be nearly impassable and the large loads had a tendency to jackknife. The teamsters who drove these teams were highly skilled and the horses massive powerful animals who were highly prized by the mill owners. Trotters at the Calais Fair. Not all horses were beast of burden, many were breed to race as trotting horses. The area became well known for producing first rate racers.A century ago a good part of population of Calais would have spent Sunday afternoon at the races either at the Calais Trotting Park or across the river at the St Stephen Fairgrounds. Calais had a number of well known horse owners and breeders including Wilfred Eaton, J.M. Johnson, Charles Cone and Charles Kyle and some fairly famous horses were either bred or owned by locals. 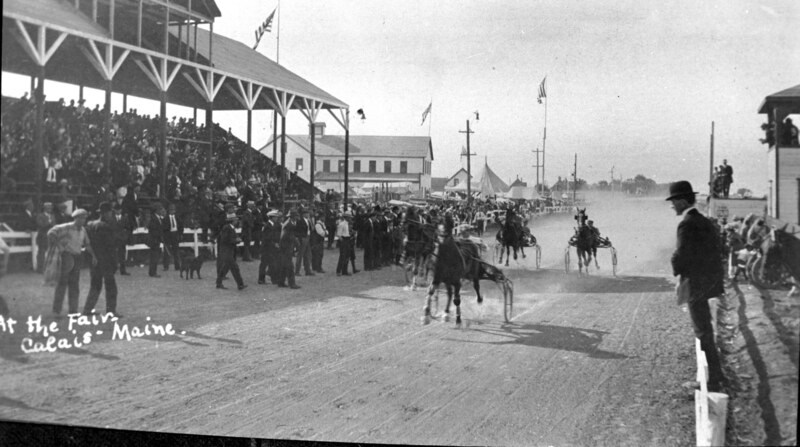 All the area towns had trotting parks and the best horses traveled the circuit during racing season. It was not uncommon for the steamship Rose Standish to have promotions and special rates for excursions to Eastport on Eastport race days. Brass bands from all over the St Croix Valley accompanied the excursions and held a “Grand Band Tournament” on racing day. 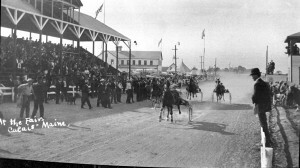 This photo can be dated to about 1912 when the new grandstand was built at the Calais ball diamond, then the fairgrounds. It was still standing in the 60’s. 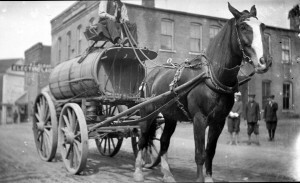 A horse drawn water wagon on Monroe Street near Algar’s Cleaners (near Mercier’s salon today). “Our good friend would probably notice the roads. There was two or three inches of dust in dry weather, but when it was wet there was at least three inches of mud. One very enterprising storekeeper in the Flatiron Block, had a load of shingle shavings put across so that ladies could cross and not get their skirts so muddy. Once, ladies organized and put a protest to the city government to see if they could not have a sidewalk to the post office so they could keep out of the mud. 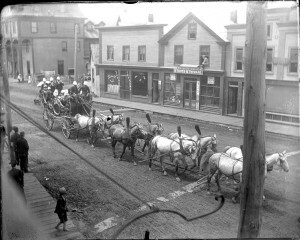 Horses, wagon and band on parade near the Flatiron Block. There were often as many horses as people in parades. These eight steeds are pulling a band in front of the Flatiron Block which is now Triangle Park. To the right rear is the St Croix Exchange which became the St Croix Hotel. This photo is very early, probably in the 1880’s. 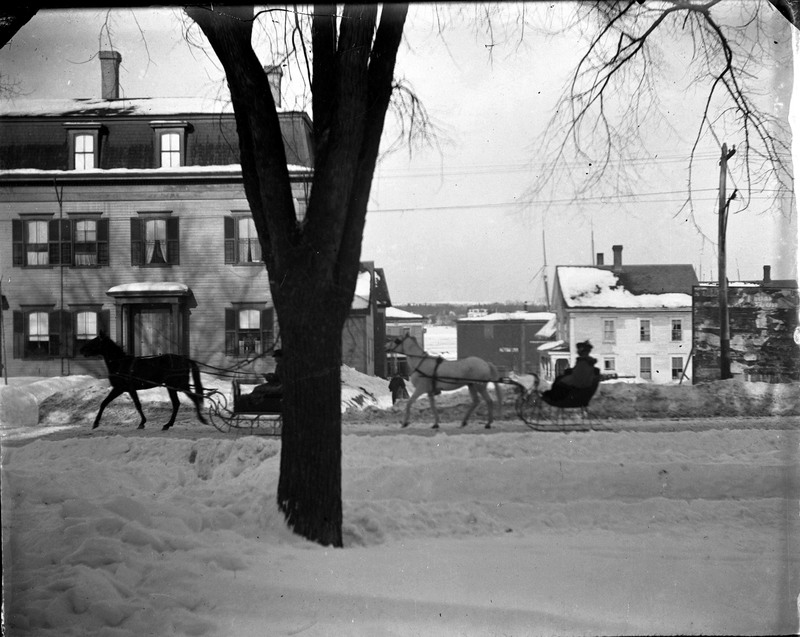 Sleighs on Main Street near Holmes Cottage in 1898. The Charles Hotel is across the street. For at least a century in the St Croix Valley most people had a personal relationship with a horse. Large barns were attached to houses to stable the family horse and store the carriages and sleighs which provided transportation to members of the family This 1898 photo shows two sleighs passing in front of the Holmestead in Calais 1898. Across the street is the building many of us knew as the Charles hotel. Water Street in St. Stephen, N.B. after 1895 but before the arrival of cars. With the coming of spring the sleigh was retired and Old Dobbin was hitched to the family carriage. There were bewildering number of types of carriages just as there are dozens of models of cars today. 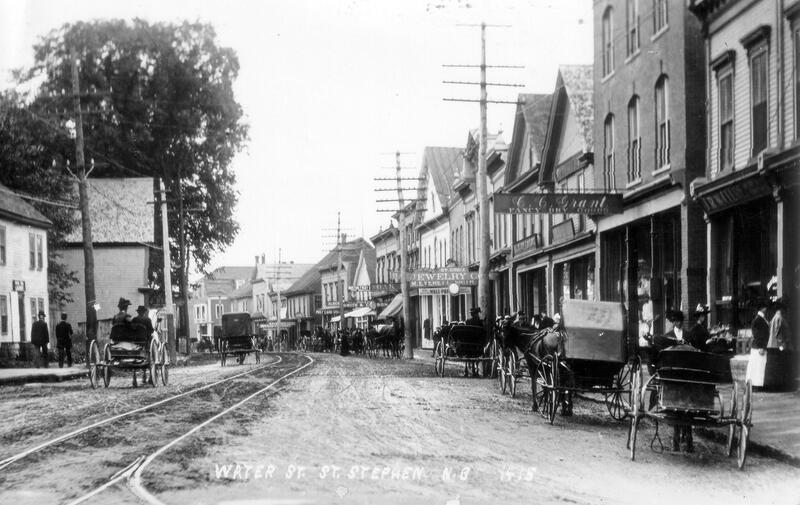 Some are on view in this photo of Water Street in St Stephen about 1900. The intersection of transportation can be seen here in St. Stephen: horse and buggies and an early car are each visible. The fate of the horse is best illustrated by this circa 1920 photo of Water Street in St. Stephen. The horseless carriage coming directly at the photographer has its left wheels in the center of the streetcar tracks.The horse was fast becoming obsolete but, as Salinger pointed out, no less human. We have dozens of other photos of horse engaged in different occupations but the photo above seems a good place to end this piece. However one thing does trouble us. 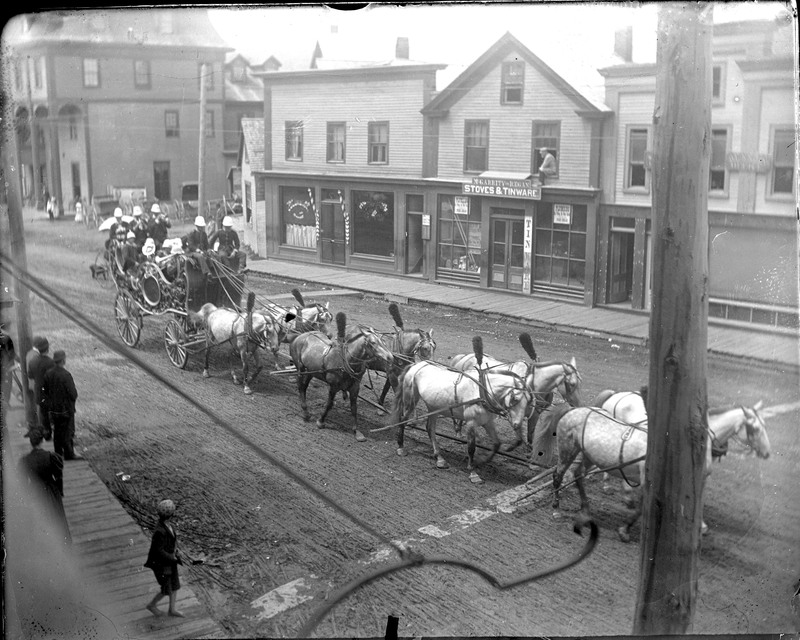 Was it possible to go in reverse with a horse and buggy or a six team horse pulling several tons of lumber? If not, maneuvering must have been difficult in tight, crowded places. If anyone knows the answer please enlighten us, it is something an historical society ought to know.